BILLINGS, Mont. – Dakota Buttar sat shirtless in the locker room Sunday afternoon with his left arm tucked into a blue sling. Buttar’s weekend had gotten off to a promising start with two consecutive rides at the Billings Invitational, presented by Cooper Tires, and then it all went to hell in a matter of 3.88 seconds Sunday afternoon inside Rimrock Auto Arena. Buttar was attempting to ride Talking Smack when he became hung up and then flipped over the front end. 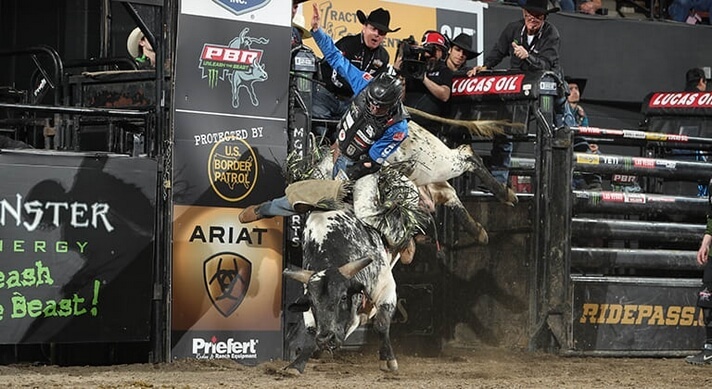 The 26-year-old immediately grasped at his left riding arm and was tended to by the PBR Sports Medicine team. “I think my hand stayed in my rope and I ended up on his head, and when he threw his head up it just pulled on everything,” Buttar said. Buttar was unable to compete in the championship round, and he plans on getting his arm looked at back home in Saskatchewan. Buttar (2-for-3) finished 17th overall in the event with 7.5 world points. The No. 36-ranked bull rider in the world is 10 points behind No. 35 Daylon Swearingen. Buttar was one of three bull riders that were unable to compete in the championship round. Red-hot rookie Mason Taylor missed the final round after be bruised his left thigh when Total Feeds Bushwacked bucked him off in 2.32 seconds and stepped on him in Round 3. According to Freeman, Taylor is probable for the Wrangler Long Live Cowboys Classic in Columbus, Ohio, on April 27-28. No. 7 Ryan Dirteater, who was celebrating his 30th birthday, missed the championship round because of a bruised left buttock when Solid Iron’s Hammer Down tossed him onto his backside in 4.32 seconds in Round 3. Things continued to get worse for No. 33 Junio Quaresima on Sunday. Quaresima was already riding this weekend with a fractured hip and can now add a broken nose to the list. He sustained the broken nose when he landed face first after Wild Goose bucked him off in 2.15 seconds in the championship round. No. 5 Luciano de Castro missed a second consecutive day of competition because of an illness.